As the gallery is focused solely on William Robinson’s work, we are interested in finding innovative ways of exploring his practice and engaging a wider audience with it. We are fortunate enough to be a part of a multidisciplinary university with fantastic resources such as The Cube that allows for exciting collaborations. Both venues have a strong focus on education, so it was only natural for a partnership between the spaces to showcase Bill’s work to its full potential. Even though the gallery is dedicated to William Robinson’s artworks, the Gallery works independently from Bill and he is appreciative of the effort that goes into honouring his practice. While his work is important to him, Bill isn’t prescriptive with it and understands that once it leaves him, it takes on a new life. He began his career as an educator and was blown away by this project with The Cube as it facilitates a deeper engagement with his paintings that have never really been explored before in his 60 years as an artist. 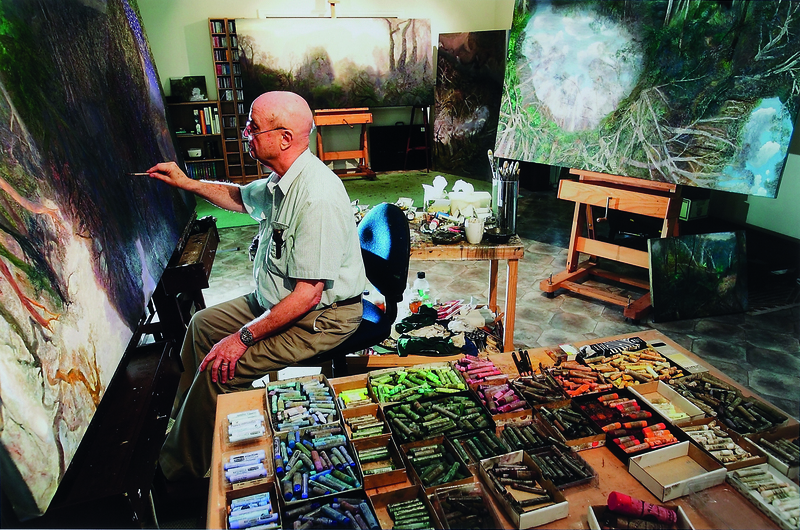 R. Ian Lloyd ‘William Robinson in his studio, Brisbane’ 2005. Colour giclée print. QUT Art Collection, Brisbane. Gift of the artist, 2009. Simon: Once the project was underway, what was the process of having William Robinson’s work digitised at the scale required for The Cube screens? One of the most important aspects of the project is the ability to view the works at a detail level that had never been attempted before, we explored a few options including the possibility of building an art scanning robot! Ultimately, we managed to resolve the detail using traditional optical methods. We photographed each painting in sections then combined each section into the final image. The final images are huge, more than one gigabyte each, that’s over 500 times larger than your average smart phone photo! 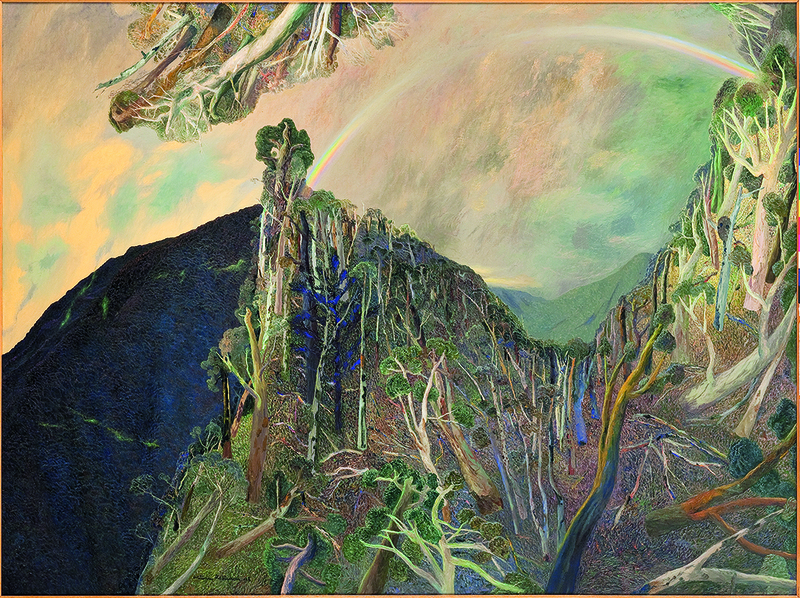 View of William Robinson’s ‘Tallabanna with cloud front’ 1998, oil on linen, QUT Art Collection, Gift of the artist under the Cultural Gifts Program, 2005. Vanessa: The exhibition at the William Robinson Gallery will feature the original artworks that have also been digitised for The Cube. What do you feel visitors will discover about Robinson’s work by having both a ‘digital and analogue’ experience? It has been discovered that, on average, people spend about 15 seconds looking at a painting before moving on. Bill’s landscapes are complex and ethereal, demanding a higher level of engagement from the viewer as they are more atmospheric and sensational than a cut-copy representation. By digitising some seminal works from the exhibition, audiences can partake in a more immersive experience allowing for a closer study. In an ever-digitising world, we are embracing ways of engaging a younger generation in Bill’s work by incorporating an interactive element to his paintings. William ROBINSON, ‘Passing storm, late afternoon, Beechmont’ 1993, oil on linen, QUT Art Collection, Donated through the Australian Government’s Cultural Gifts Program by William Robinson, 2017. Simon: When can visitors see Nature imagined at The Cube, and will there be any activities that they can get involved with to explore the project? We are hosting a free Winter Holiday Program at The Cube, opening Saturday 7 July. 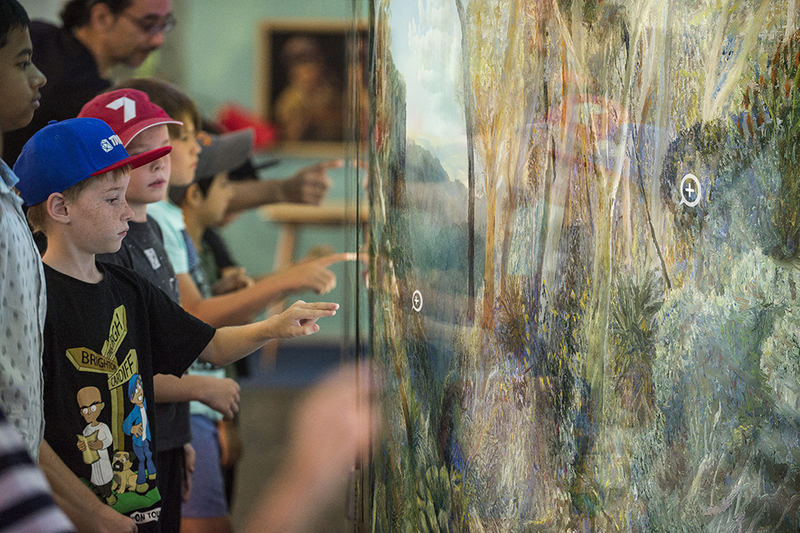 The holiday program allows kids to explore the key themes from Nature imagined including geology, landscape paintings and South East Queenland’s natural environment. A diverse range of science and art activities are on offer. 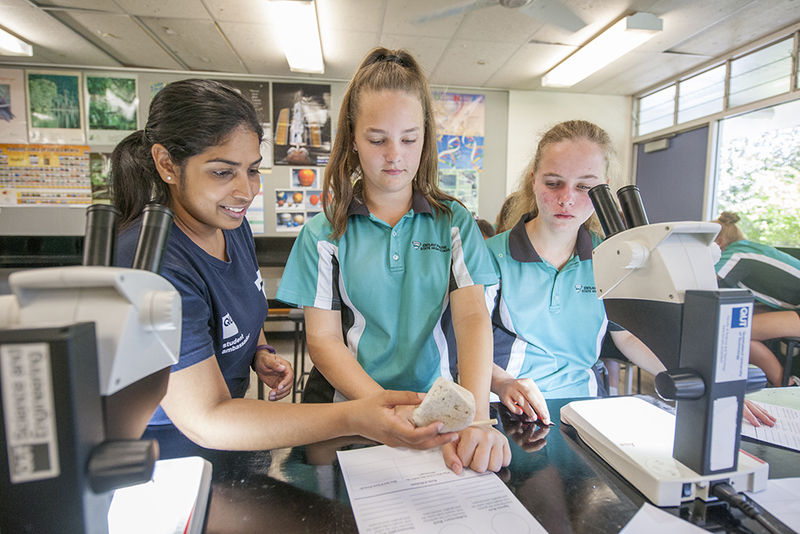 Take a closer look at the Springbrook area by getting hands-on with art and contributing to a collaborative collage using microscopic imagery from the region. Go on a digital scavenger hunt to uncover fun facts about the local flora and fauna or chill out in our read and relax area with videos and books of Bill’s work. For any budding geologists in the family, don’t miss the chance to see amazing minerals through the polarising microscope and experiment with the augmented reality sandpit. The Nature imagined dual exhibition will be open throughout the program so visitors will can view the digital works at The Cube and the original paintings at the William Robinson Gallery. Become a budding geologist workshop, 7-14 July, 2018. Vanessa: Nature imagined opens at William Robinson Gallery at end-June. Can you share a sneak preview of some of the exhibition highlights? This exhibition provides a unique opportunity for people to see the process by which Bill creates his multi-layered and multi-dimensional landscapes. We have included quite a few works on paper from the artist’s private collection as well as his sketchbooks from around the time he was painting large-scale landscapes, which demonstrate his remarkable approach. You will see the mind of a great colourists, where form and colour are paramount to his ideas and picture making – but most importantly you will see the great imagination of the artist and how he can realise these complex pictures that present a new way of understanding our environment as well as an insight into his lived experience of the natural world. Thanks, Vanessa and Simon, for this in-depth analysis of Nature imagined.